This is my first post on this forum and I hope to get help, because I‘m running mad on this. 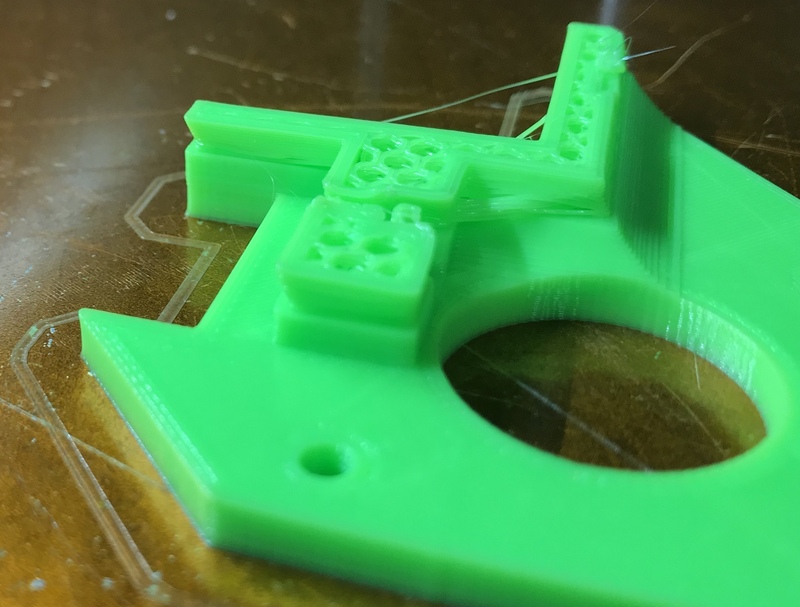 My Mendel has a problem during printing. Somehow and not reproduceable on a specific layer, the print begins to „detach“ from the layer before. Don‘t know how to describe it better. what is you nozzle size? 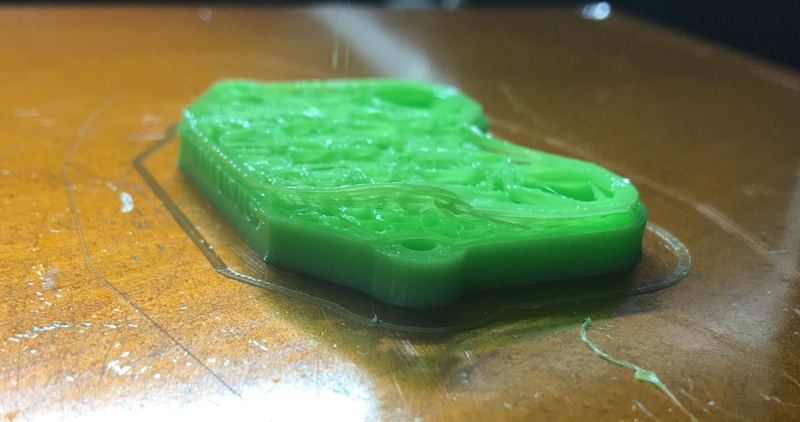 are you obeying the rule layer heights should not exceed 80% of nozzle diameter ? Do you have a part cooling fan? Have you got a picture of what the part is supposed to look like. It looks like the top is shifted in both X and Y? 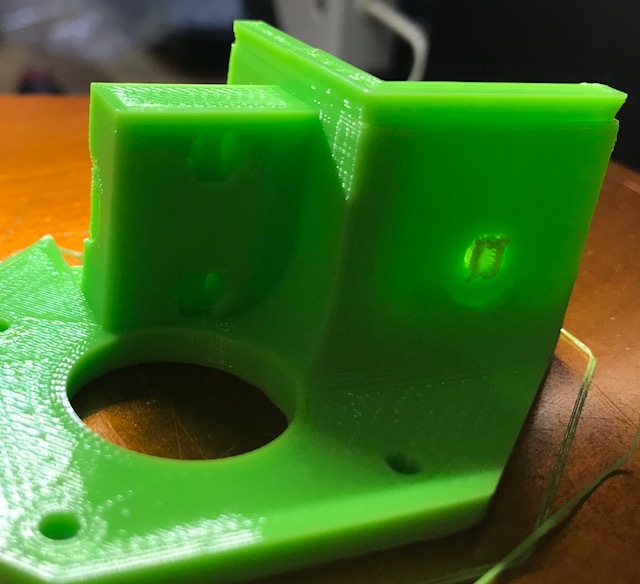 Are you sure the filament isn't dragging on the print head? Do you have it feeding through the PTFE tube. If not it can lift the print head and cause layers to not attach properly and also cause X shifts. Can't explain a Y shift as well though. Attached you will find the part I want to print. Now I have this problem and I do not have an idea…..
Maybe I found the problem? No noob problem. Watched the complete process and almost finished fine...but happend again 10 minutes before ending. Is there a proofed way to change the normal screwbars to lead screws? Is this an older machine with springs in the X axis parts holding the Z axis in place between two nuts? or a newer version without springs? It's hard to say without watching it go wrong or a better description. It seems to get offset in both X and Y simultaneously and also seems to get smaller and taper back out to the correct size. I can't think of anything that would do that but perhaps I am interpreting the pictures incorrectly. Is the carriage firmly attached to the rails? Sometimes the carriage can break at the back where the third bearing is. In that case, if you don't have the PTFE tube the filament will drag and tilt the carriage updwards. That would cause the nozzle to swing back and up and cause layer to be shifted and not attached. Noticed a little lag during printing, the printer stops for half a second. Okay, thought it could be, because I stored the print file on OctoPi. Did another test with the same print file on the SD card, but the same result. Also moved Z by hand all the way up and down to prove if the screws are moving smooth and they do. Anybody a hint how to do tests to search for the reason? Edited 1 time(s). Last edit at 09/25/2018 02:51AM by dasneo72. could this be a solution for me or an usefull upgrade to a Mendel? I don't know, my Mendel90s still work fine with the original lead screws. 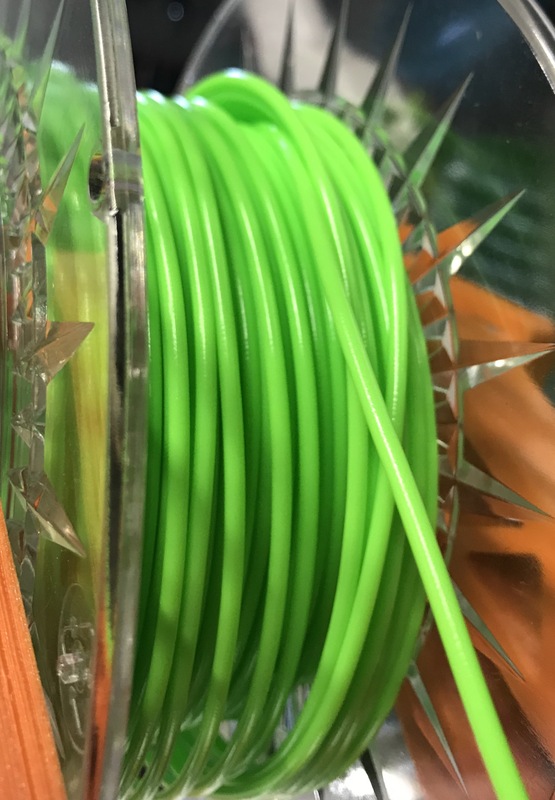 I would start by installing the PTFE tube that stops the filament dragging on the print head. If the filament is hard to pull it can lift the carriage. Even if it doesn't it pulls towards the centre at the edges of the print and increases backlash, that is why it is in the design. okay... I will order the tube again and do some Tests. Ok, after many, many diferent tests found an hint. Seems like the CPU capacity is reached when I access with my laptop and mobile to the Octoprint GUI. In this moment the printer stucks for a second or more and the next layer is chaos. Hmmmm....should I replace the PI with a newer one? It should carry on where it left off, so the worst would be a blob. Seems more like some lines of G code go missing. Have you been able to reproduce the effect at will? Possibly a faster PI might help but I still use RPI Bs to run my machines. I haven't updated Octoprint for a long time though as it does seem to get slower with each new release like most software. I try to stick with versions that work and only update if I have to. Doing some bigger prints right now without opening the GUI and all went fine. Have to read how to change the PI. Thx a lot for helping!